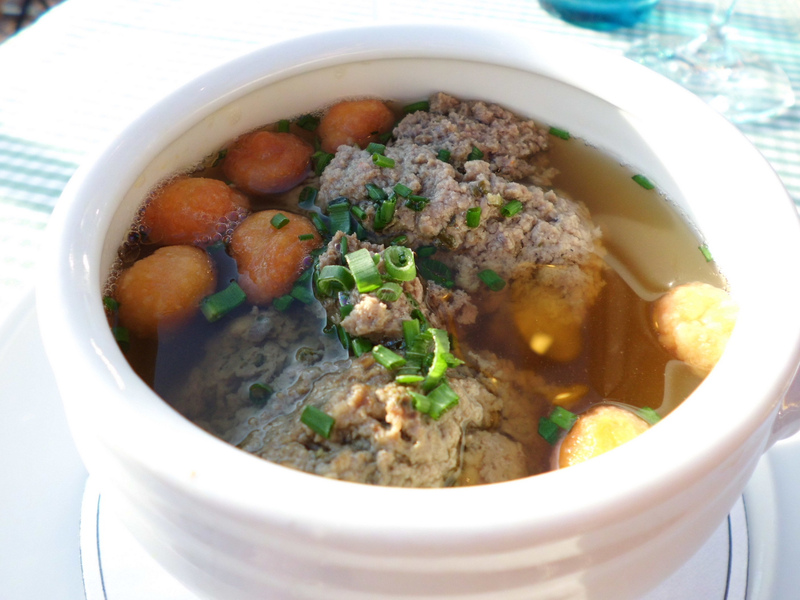 The German liver dumpling soup is a Bavarian Specialty and called in German "Leberknoedelsuppe". Knoedel is a dumpling and Leber is liver. If you travel to Bavaria one day, don't forget to try one; you can get this soup in almost every Gasthaus. The home made recipe's base is a beef broth, as described in one of my former recipes. In Germany you can buy the Leberknoedel in cans or frozen, unfortunately not in the USA. We have to make them! Happy Cooking! - Bring the broth in a bigger pot to a boil. You can use also organic instant beef broth. - Run the beef and liver through a meat grinder. - Soak the buns in warm water. - Peel onions and chop them fine; wash herbs and chop them too. - Add the meat into a bowl and mix it with onions, herbs and eggs. - Squeeze the water thoroughly out of the buns, mix it with the meat. - With moist hands form dumplings, not too big, with a foam spoon put them into the boiling hot broth, reduce heat. - Let sit for 15 minutes. - Important: Don't bring the broth to a boil anymore otherwise the dumplings will fall apart. Serve the soup with some sprinkled parsley on top. Oh I just LOVE liver dumpling soup. Even a pale broth becomes really good, if you boil some dumplings in it! Yummy! I use a different recipe for the dumplings: Mince some liver (a pound maybe) in your kitchen machine. it’s a bit of a mess 🙂 Give in some salt and pepper. Add herbs, if you like. You also don’t need eggs. Then add breadcrumbs, maybe 4-5 big spoons full (if you use a pound, if less use less breadcrumbs) und mix it. Put this in the fridge for maybe half an hour. Bring the broth to boil. If you now take the liver out of the fridge you will see, that the mixture is now more like a dough, much less liquid. You can take portions out of it and roll it to dumplings between your hands. put them into the boiling broth and wait till they’re done. They don’t fall apart, even if the broth boils a bit. The taste is a bit stronger than a dumpling that consists of meat but also very good. thanks fo this variation, you always can send me more of your delicious recipes. My “nana” made this soup in gallons….she used 1/3 liver to 2/3 beef and added raw rice to the mixture to help bind it together. Here is my recipe for Super Sauerkraut: one onion, one red apple, one potato…one pound Polish sausage, one jar sauerkraut…one beer…Dice the onion, and fry it. Dice the potato, which has already been cooked, add it to the pan. The Polish sausage, I cut in one inch pieces usually, add to pan. Drain the sauerkraut, add to the pan. The red apple, core it, and chop it, add to the pan. Add enough beer to keep it moist. My favorite is a berry-honey beer, it’s kind of like half beer, half wine, but almost any beer should work fine. My grandmother’s family came from Germany and Prussia, but I made this recipe my self, didn’t get it from her. Lived in Wiesbaden in the 1980s frequented a Bierstube owned by a bavarian. My fav menu item was gegrillte leberknodel mit bratkartoffeln ( fried potatoes ) & saurkraut. After boiling the leberknodel he’d throw them on the grill for a minute or two.